The early run-up in the month was likely tied to interest in the sector ahead of the elections, as the index rallied more than 24% in the first week of the month. A flood of new issues coming to market, including Acreage Holdings (CSE: ACRG) (OTC: ACRZF), DionyMed Holdings (CSE: DYME), Dixie Brands (CSE: DIXI), Green Growth Brands (CSE: GGB) (OTC: XTHCF), Grown Rogue (CSE: GRIN) (OTC: NVSIF), Harvest Health & Recreation (CSE: HARV) (OTC: HTHHF) and MJardin Group (CSE: MJAR) (OTC: MJARF), most likely weighed on prices over the balance of the month. Most of the companies reported robust quarterly sales growth during the month. 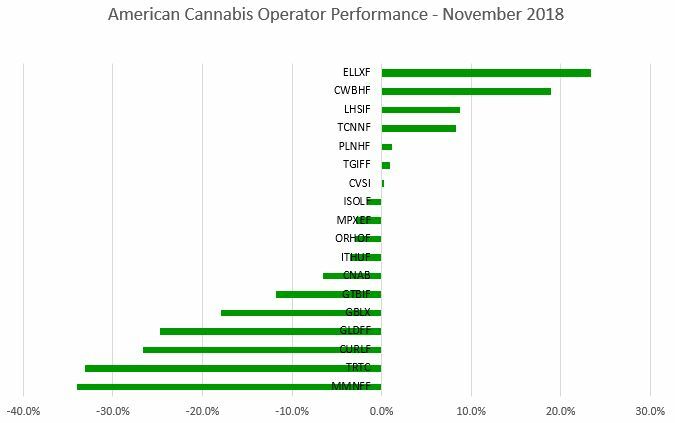 The best performances came from CBD manufacturers Elixinol Global (ASX: EXL) (OTC: ELLXF) and Charlotte’s Web Holdings (CSE: CWEB) (OTC: CWBHF) as investors contemplated the likelihood of the Farm Bill passing before year-end, with Liberty Health Sciences (CSE: LHS) and Trulieve (CSE: TRUL) (OTC: TCNNF) leading the MSOs. MedMen Enterprises (CSE: MMEN) (OTC: MMNFF), Terra Tech (OTC: TRTC), Curaleaf and Golden Leaf Holdings (CSE: GLH) (OTC: GLDFF), all of which filed quarterly financial reports during the month, each declined in excess of 20%. MedMen priced a bought deal but then lowered the offering price. Terra Tech and Golden Leaf announced a non-binding agreement to merge early in the month. Terra Tech reported a 33% decline in its cannabis revenue during the third quarter. When reporting its Q3 financials, Curaleaf offered guidance for 2019, suggesting it will generate revenue of $400 million, with free cash flow in excess of $100 million. The stock ended the month more than 38% below the C$11.45 where it raised C$520 million in advance of going public in October. For December, the index will include 17 names, as 1933 Industries no longer qualified due to its trading volume in the United States declining below the minimum. There are several names we expect will join in the near future, though they don’t yet have actual OTC listings (though some do have grey market tickers). In the next monthly review, we will summarize the performance for December and discuss any additions or deletions. 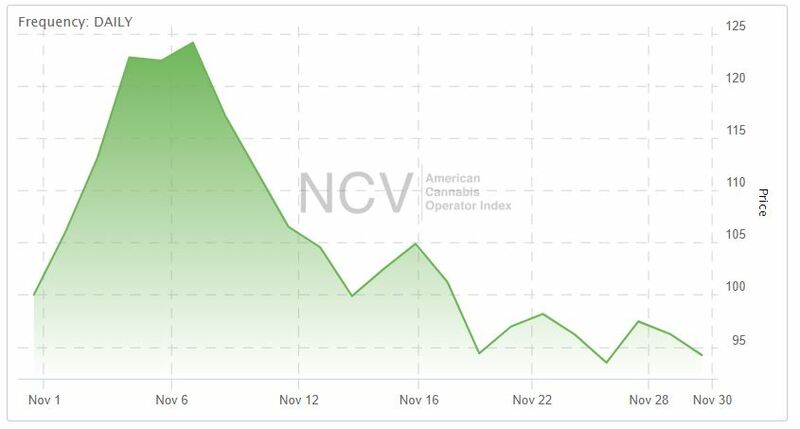 Be sure to bookmark the page to stay current on American cannabis operators stock price movements within the day or from day-to-day.